Want to know more of the Cross' meaning? The universal symbol of the Christian faith is neither a crib nor a manger, but a gruesome cross. Yet many people are unclear about its meaning, and cannot understand why Christ had to die. 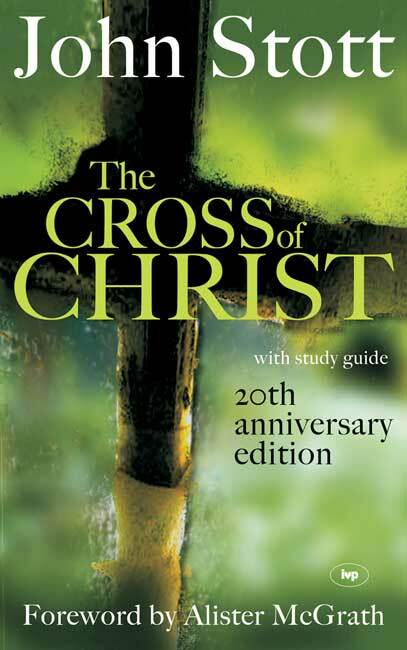 In this magisterial and best-selling book, John Stott explains the significance of Christ's cross and answers the objections commonly brought against biblical teaching on the atonement. John Stott's modern classic is as sharp and pertinent as ever it was. It combines an excellent biblical exposition, and a characteristically thoughtful study of Christian belief, with a searching call to the church to live under the cross. With study guide and a fore word by Alister McGrath. The Cross of Christ by John R.W. Stott was published by Intervarsity Press in October 2006 and is our 3388th best seller. The ISBN for The Cross of Christ is 9781844741557. A 2014 reprint of the 2006 Centenary edition of John Stott's amazing work on the Cross of Christ first printed in 1986, with the study guide that was later produced in 1989 included in it. This is a weighty book indded as one would expect of such an important subject, but it is written in Stott's normal style and is therefore very readable , and yet with no lack of depth and insight to it for all it's approachableness. Within the span of the 400+ pages Stott provides a clear explanation of the biblical and historical basis of most of the doctrine surrounding the crucifixion of Christ, however it is not just dry facts, there are here interesting and challenging questions that encourage us to think more about that which we sometimes simply just take as a given. A modern classic to be sure and worthy of this reprint. Got a question? No problem! Just click here to ask us about The Cross of Christ. 2 Why did Christ die? "In the twenty years since its publication, John Stott’s The Cross of Christ has established itself as the most respected and authoritative evangelical writing on this most important of subjects. It remains the standard work on its great themes, inspiring, challenging, encouraging and informing its many readers.